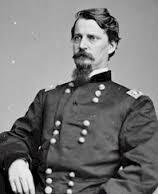 Today in Masonic History Winfield Scott Hancock is born in 1824. Winfield Scott Hancock was an American soldier and politician. Hancock and his twin brother were born in Montgomery Square, Pennsylvania. After attending public schools, in 1840, Hancock received a nomination to the United States Military Academy at West Point. He would graduate 18th of his 25 member class. After graduating from West Point, Hancock would serve in the Mexican War and would be part of the unit that attacked Mexico City. He also would be stationed in Fort Myers, Florida during The Seminole War. He would see no action there arriving at the duty station toward the end of the war. Hancock's biggest moment during the Civil War came at the Battle of Gettysburg. On the first day of the battle, Hancock's friend, Major General John Reynolds was killed. Major General George Meade, the new commanding officer assigned units to Hancock to help fill the the gaps in the command structure. This said a lot about Meade's trust in Hancock since, at the time, there were several men who held higher rank at the battle. On the second day, Hancock had a famous incident where he sent the 1st Minnesota against a larger confederate force. The 1st Minnesota sustained 87% causalities in the battle. The tactic is credited though for holding on to the defense of the Union line long enough for the Union to reorganize. On the third day, Hancock's position was in the center of the Union line and bore the brunt of Pickett's charge. During the battle, Hancock rode prominently on horseback. When a soldier under his command told him that the commander should not be in such a visible position, Hancock allegedly replied "There are times when a corps commander's life does not count". Shortly after that Hancock was wounded when a shot hit the pommel of his saddle sending wood and a nail into his upper right thigh. When Hancock pulled the nail from his leg, thinking it was fired by Confederates he commented, ""They must be hard up for ammunition when they throw such shot as that." After the war, Hancock was assigned to supervise the execution of the Lincoln Assassination Conspirators. Although he did have some hesitation, particularly when it came to Mary Surratt and other less culpable conspirators, he would carry out sentence on all of them. Of the executions he would later write, "every soldier was bound to act as I did under similar circumstances." In 1880, Hancock would be named the Democrat nominee against James Garfield. Both candidates were closely matched in their stances on issues and Republicans were concerned about going after Hancock because of his hero status from the Civil War. Eventually the Republicans would latch on to a tariff issue that would affect income of factory workers in the north. This cemented Garfield's Victory. Hancock was a member of Charity Lodge #190 in Norristown, Pennsylvania.